In April 2012, the UN Security Council unanimously decided to send unarmed military observers to Syria in order to monitor a ceasefire between the Syrian government forces and armed opposition fighters. 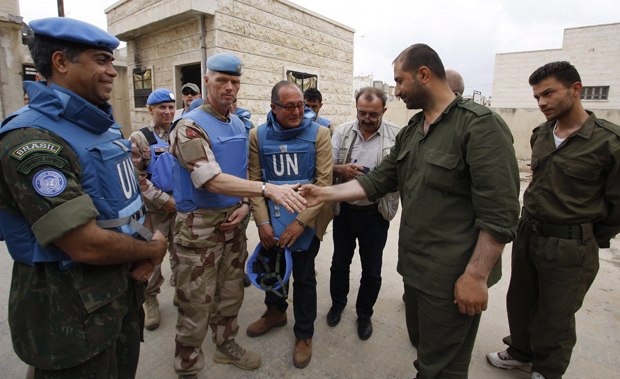 The role of the UN observers is to break the growing cycle of violence and today, dozens of them are in Syria. Their role is unquestionable but we can be pessimistic about their results. Robert Mood, the head of the U.N. mission in Syria, stated: “What I’ve seen since I’ve arrived on the ground is that my observers, where they are, have a calming effect”. But as soon as they leave, violence and scenes of devastation take place. The observers cannot be everywhere. It took a year for the decision to send observers to be taken, and the overall situation is not evolving. The UN needs to act in order to demonstrate to the world the power of the international community. However, it is not solving the political problems that exist between the members of the Security Council, and the pressure on the Syrian regime isn’t producing the expected results. There is a need to see a political process begin. But, as violence is renewed, it is necessary to already plan the next step. This entry was posted on 07/05/2012 by ISIS Europe in François Ducrotté, Opinions and tagged Syria, United Nations.